SWe followed with the freebies for the event of the moment with this super frame for halloween photo. If you are here, it is because you are decorating the house with a totally terrifying atmosphere with pumpkins, cobwebs, bats, etc. Sure you have photos of the little ones, but they will be a bit boring in their usual frame. 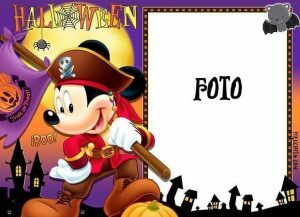 Get some frame for photos of 18x13cm and allow the kids to be the envy of their compais by showing them their photos next to the special Halloween Mickey Mouse. PNG: Having a transparent background, with a program like Photoshop or the free Gimp, you can put the child's picture on the back layer and print it directly. UPGRADE: Do you want to have the same frame but with Minie Mouse? Here it is.